Many organizations and businesses mistakenly believe that if they provide the tools for community engagement and interaction, a community will form on its own and ultimately engage and interact. Nothing could be further from the truth. A study of more than 100 businesses with online communities found that 35% had less than 100 members and less than 25% had more than 1,000 members, a clear indication that the tools are not enough. Engagement is the holy grail of building successful online communities and connecting with customers online and here’s your chance to learn from someone with experience. 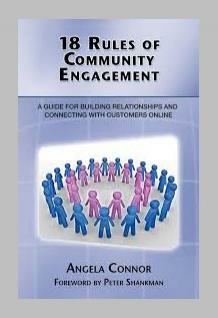 In “18 Rules of Community Engagement,” Angela Connor shares how she helped her online community surpass 11,000 members in 18 short months. This book is a definitive guide for those seeking to facilitate and grow online communities and develop social media strategies for themselves or their organizations. It is a playbook on exactly what it takes to be successful, with insights from community experts and practitioners. After reading this book, you will have the knowledge needed to drive user engagement and bring people together online regardless of the age of your community or stage of its development. Can you afford not to read this book?